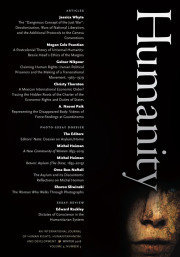 Our new issues features the exciting dossier coedited by Amal Hassan Fadlalla and Omalade Adunbi on human rights and humanitarianism on the African continent. And Joseph Morgan Hodge concludes his epic survey of the historiography of development. Finally, we are honored to show some of Yepoka Yeebo’s photographs of the informal economy in Ghana, together with a comment from Keith Hart, who coined the phrase “informal economy” decades ago.